Cleopatra's slaves used them to keep her comfortable as she sailed on her barge. The Chinese associated them with mythical characters. The folding variety we all recognize originated in Japan, but China became famous for them. Once they arrived in Europe around 1550 with traders from the far east, they became a plaything of the nobility. Nowadays, I seldom see them, except on warm summer Sunday mornings when a woman inevitably puts one to use during church services. Fans have come a long way, baby. As a historical writer, fans are an essential accessory to my female characters. (And through the post I'm sticking to European--primarily British--fans.) I knew they were used for flirtatious purposes, and I knew they were beautiful, but who knew they had their own language? First, a bit of background. Fans became an essential accessory for well-bred females, and they no doubt own different fans for mourning and various types of social events. In the early 1600s, fans were often "fixed," or made of feathers attached to a handle: they did not fold. 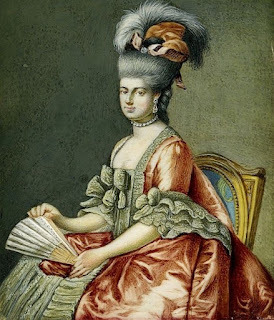 By the end of the century and into the eighteenth century, folded fans had come into their own, and it appears that if a lady used a fixed fan, she labeled herself as not at all up on things. Or common. Tsk tsk. Ladies also used cockade fans, which are pleated paper attached to two sticks. 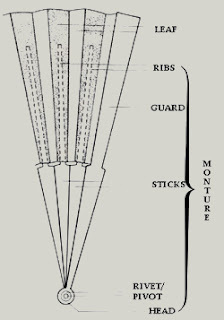 They open into a full circle with the end sticks forming a handle--although I have not seen them in portraits or read of ladies using them at balls. However, I am not an expert. Just passing along the info. There were also brisé fans, where separate sticks are fastened together at one end like the folding fan, but they did not use fabric or leather. Rather, the sticks were painted individually to create a scene or were ornamental, and were often held together at the top with a ribbon. It was much harder to paint on these fans than a folding fan. Painted fans were certainly popular, and often depicted pastoral, Asian, mythological, or Biblical scenes. In the eighteenth-century through the Regency period, Vernis Martin fans were valued. Vernis (French for varnish) was a technique developed by the Martin brothers, who hand-painted the scenes. This Vernis Martin Fan had mother-of-pearl guards. Apparently, ladies painted images on their own fans, too: Princess Augusta, aunt of Queen Victoria, painted one that now belongs to her Majesty, Queen Elizabeth II. According to documentation, it was created around 1790 and the medallions painted on the panels were done by "one of George III's daughters." Here enters the so-called Language of the Fan.The fan was no longer a pretty frippery, or a cooling device, but also a method to convey secret codes. Perhaps he misunderstands because this gets so complicated, m'dear. While many a female no doubt practiced these motions before the looking glass, one wonders how many gentlemen scratched their bewigged heads in utter cluelessness. Also, how many matchmaking mamas were so oblivious that they wouldn't understand what it meant when her daughter threatened a suitor with a shut fan? 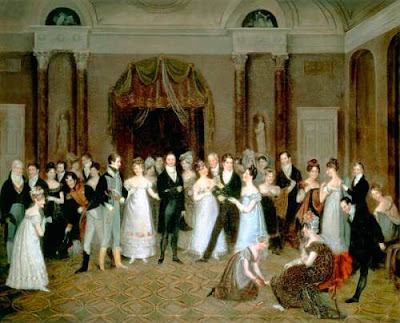 The Language of the Fan seems to fallen out of vogue for a generation: the Regency. Fans were still an essential accessory, however. This Regency lady is ready for a magical evening at Lord and Lady Fabulous' ball. She is wearing her gown of pink crepe, a toque on her head, elbow-length kid gloves, her satin slippers, and carries--of course, her fan. 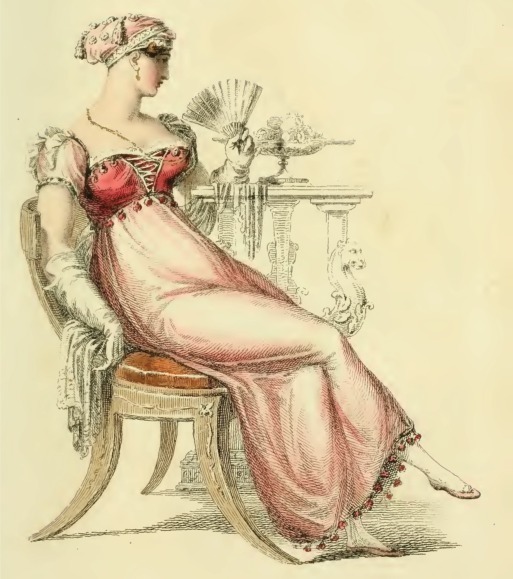 She may not use it to send secret codes, but no fashion-minded, status-conscious British lady of the 18th and 19th century would attend a ball without one. Rolinda Sharples' painting, Cloak Room, Clifton Assembly Room, was painted in 1817. Look at all these Regency ladies holding their fans! It might be difficult to view, but many of the fans appear to be white or sheer. The Victorians took fans to a whole different level. French maisons created fans for the very wealthy. Tablitiers carved exquisite sticks, and famous artists painted (and signed) fans. As the language of flowers became popular again, no doubt the language of the fan refreshed, as well. Alas, fans as a fashion statement seem to have gone the way of the elbow-length glove and the bonnet. So for now, my experience with gorgeous fans will have to be limited to my imagination, when my characters use them to their advantage. Your Turn: Do you own a fan? Susanne Dietze began writing love stories in high school, casting her friends in the starring roles. 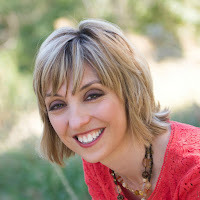 Today, she's the award-winning author of ten new and upcoming historical romances who's seen her work on the ECPA and Publisher's Weekly Bestseller Lists for Inspirational Fiction. Next month sees the release of "The Honeymoon Express" novella in The Rails to Love Collection. Married to a pastor and the mom of two, Susanne loves fancy-schmancy tea parties, travel, and curling up on the couch with a costume drama and a plate of nachos. I have a beautiful painted fan that belonged to my best friend. 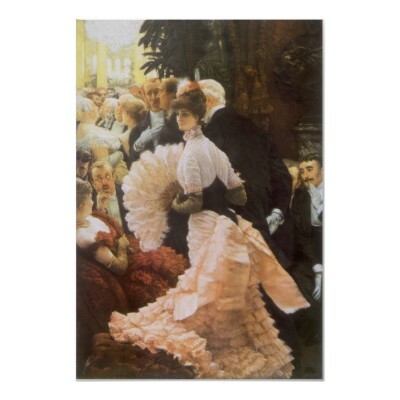 I loved learning how ladies managed to converse with gentlemen in a day when proper introductions had to be made first. Creative minds always find a way, don't they. Stephanie, your fan sound like a treasure. What a precious gift! Creative minds do indeed find a way. I'm sure many a teenage lady was fluent in the language of the fan. I imagine I would have been, too! Yes, I do. A school friend brought me one back from her family visit to Japan back in the early 70's. I've always loved flicking it open. What a delightful souvenir, Anita Mae! It must be lovely. I attended a wedding this summer where the bride and groom offered fans for the guests to stay cool during the ceremony. Isn't that a neat idea? Susie, thank you so much for sharing this interesting post. I'm impressed with how much there is to remember! hahaha...with my hot flashes, I am never without some kind of fan. My favorite type is the folded kind with designs. I love these pictures. Thanks for sharing.